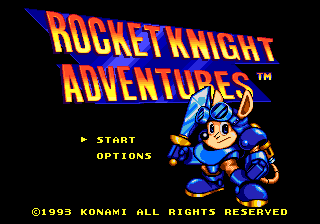 Rocket Knight Adventures (ロケットナイト アドベンチャーズ) is a 1993 platform game developed and published by Konami for the Sega Mega Drive. It was the first in a line of successful games, continuing with Sparkster: Rocket Knight Adventures 2, a unrelated game Sparkster for the Super NES and more recently, Rocket Knight for the PlayStation Network, Xbox Live Arcade and PC. The game stars an opossum named Sparkster who carries a sword and jetpack in an attempt to rescue a princess from the evil Axel Gear. Sparkster's primary weapon is his sword ( or ), which he can use to fire a short-range projectile. However, it will do greater damage to an enemy if it makes direct contact. The sword can also be used charge the jetpack by holding the button down. Charging the jetpack until the energy bar is full and releasing the button will make Sparkster spin on the spot, whirling his sword in all directions. This will do additional damage to nearby enemies and is useful when Sparkster is surrounded. Releasing the button while pushing a direction causes Sparkster to briefly fly in that direction with his sword in front of him, also doing damage to any enemy he collides with. jumps. Apple - Restores one heart. Banana - Restores four hearts. Power Item - Lets Sparkster fly continuously for the rest of the sub-level; increases projectile range. The first stage begins with a walk through a burning village. Wide open spaces and high walls give the player a chance to practise their rocket pack skills. After defeating the first mini-boss, Sparkster takes flight using the Power Item. This part of the stage plays rather like a shoot-'em-up, with waves of small enemies followed by a dragon mini-boss. Once in the castle, the player is required to use walls to rebound with their rocket pack in order to ascend to the stage boss. Main article: Rocket Knight Adventures/Magazine articles. Main article: Rocket Knight Adventures/Promotional material.